Wear a Flower to Work Day - is it more than just a bit of fun? At Inspired to Change we love flowers so April 20th is a special day for us as it’s Wear a Flower to Work Day! The idea behind this fun campaign is to wear your favourite flower to work in celebration, commemorate or simply to make you or someone else smile. What a brilliant reason to carry nature around with us! Long before any other form of adornment such as jewellery or makeup, people would wear flowers. They have been used in history, flower crowns in ancient Greece, Polynesian women wearing flowers behind their ears, and marigolds used in Buddhist worship and decoration. In the past century many stars were associated with flowers; Billie Holiday wore a gardenia over her left ear and Morrissey from the Smiths who would often carry gladioli on stage. One of the widest use of flower wearing in the modern world is the remembrance poppy. Flowers can symbolise and be used for many different things in all cultures. They can be names for people such as Daisy or Lily, many countries have them as their national symbols – England with the Rose and Wales has the daffodil. The Japanese even have a whole language about flowers called Hanakotoba. They are used in poetry, songs and paintings, so flowers are one of the few things that can truly unite us a human beings throughout the world. Flowers aren’t just for weddings, Valentine’s Day or formal occasions. 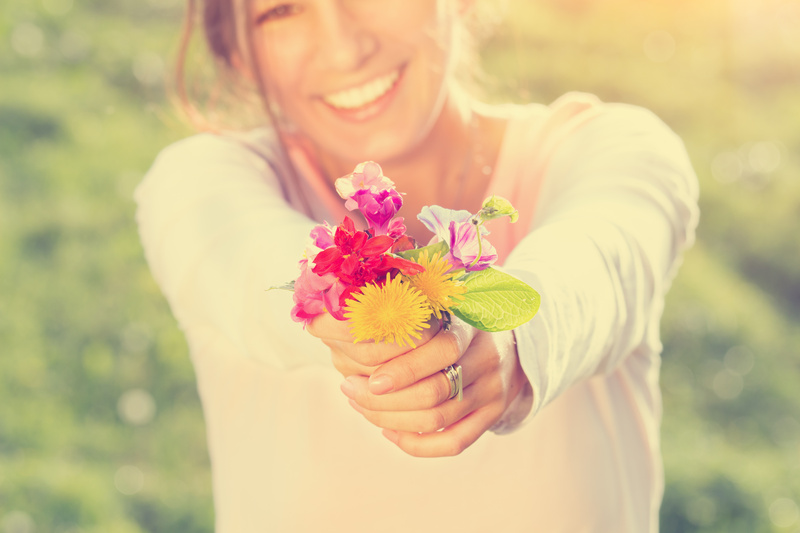 Another benefit to wearing a flower to work is that flowers have been scientifically linked to health and wellbeing. Flowers in a room not only add colour and beauty but they can also be relaxing if a bright colour or be energising if a bold colour. Flowers in hospital rooms can help patient feel less anxious, lower blood pressure and patients often require less postoperative medication. In a work environment flowers are also known to help cognitive performance so production and creativity will be enhanced leading to a less stressful workplace and less absenteeism. They can really brighten things up and have an uplifting affect on your mood. By wearing a flower to work you can instigate social interactive with your colleagues as it will start a conversation and encourage positive relationships. Flowers are one of the most beautiful objects in nature. There is a huge variety depending on season, location, humidity etc and the different shapes, sizes, scents and colours can be immense. They can be used not just for decoration but in massage oils, cooking or used as a natural cure for many issues e.g. lavender to aid sleep. So this can be an opportunity for you to be creative! If it’s not appropriate or possible for you to wear a flower to work, they don’t have to be real – it could be a picture poking out of a shirt pocket, flower sticker on your cheek or you could wear a floral design on your clothes. What flower will you choose and how will you wear it? About the Author: Carmen is based in our Market Harborough clinic. She especially likes seeing clients suffering from stress and anxiety because the results are truly life changing and they can happen in as little as 6 weeks. Carmen is also a successful piano teacher. PreviousTop Tips for Feeling Happy! Back to School – No Worries!